Find a Historical trip that explores Jordan. There are 67 tours to choose from, that range in length from 3 days up to 19 days. The most popular month for these tours is June, which has the most tour departures. "There is not much I can after reading previous reviews, you must experience the warmth,..."
"We actually did the 2-day Petra, Wadi Rum, Dead Sea and Red Sea tour. Ahmed was a..."
"A fantastic trip in an amazing country! 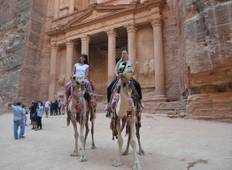 We had a great experience with Jordan Private..."